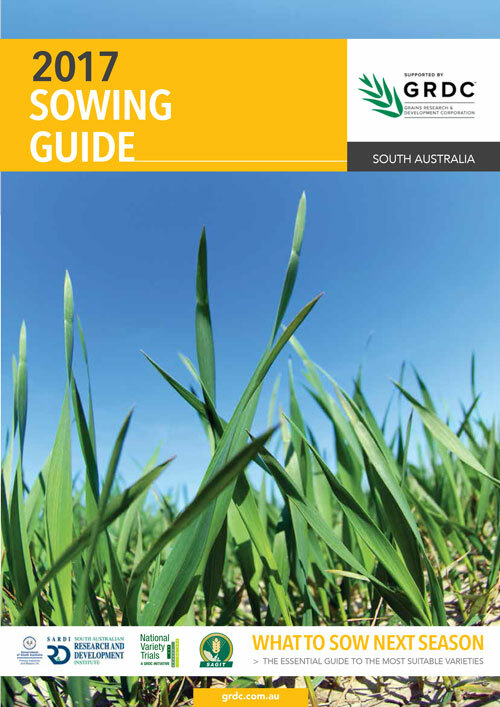 This edition of the SA Crop Variety Sowing Guide has been compiled by officers with the South Australian Research and Development Institute. The SARDI Sustainable Systems Division Officers acknowledge the sponsorship of this guide by the SA Grain Industry Trust (SAGIT) and the Grains Research and Development Corporation (GRDC), the contributions of New Variety Agronomy and Oat Breeding research staff in SA, as well as collaborative research staff in Victoria in producing results published in this edition. Almost all new varieties are protected by PBR and growers need to be aware of the implications. Newly released wheat varieties give SA growers high yielding alternatives to Mace. No new barley varieties were released in 2016. A range of high yielding malt and feed varieties are currently available to SA growers. Crop variety sensitivity to herbicides can influence choice of variety or herbicide use. Several new Clearfield® and Triazine Tolerant varieties available that will offer growers high yielding options with blackleg resistance. Many newer varieties offer alternative uses, broad adaptation, high yields, and improved grain quality relative to Tahara. No new faba bean varieties were released in 2016. PBA Samira and PBA Zarah offer alternative to Nura and Farah for SA growers. No new lupin varieties were released in 2016. Seed available in South Australia for 2017 planting of new lupin variety PBA Jurien. Likelihood of producing good milling or hay quality vary greatly between oat varieties and influence varietal choice and marketability. Morava, Rasina, Volga and Timok are resistant to rust and are the preferred varieties for grain in areas prone to rust infections. No new lentil varieties were released in 2016. Red lentil PBA Jumbo2 is currently the highest yielding Australian variety with good disease resistance. A change in the virulence of ascohyta blight pathogen now means all current varieties are either rated as susceptible or moderately susceptible in SA. No new field pea varieties were released in 2016. Several existing field pea varieties have proven to be high yielding in SA.